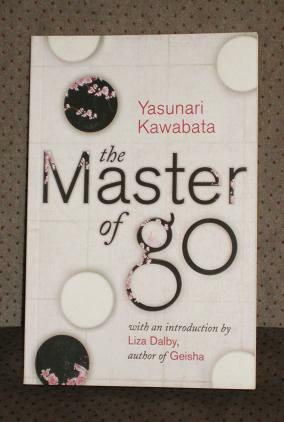 The Master of Go (translated by Edward Seidensticker) is Yasunari Kawabata’s semi-fictional account of a true event, a championship match of Go (an Oriental game played on a board with black and white counters) between the Master and a younger, more aggressive opponent. The match took place in 1938, and Kawabata actually covered the match for a Japanese newspaper, later turning his heavily descriptive reports into a book. The result of the match, and the Master’s subsequent death, are revealed at the very start of the book, and it is clear that the story has little to do with the details of the match, or even the result. Rather, the novel is a magnificent detailed psychological portrayal of a person obsessed with the game, a man whose life has been spent improving his understanding of the tactics and the more intangible essence of the art. The Master is a frail old man, at times taciturn and grumpy, at others garrulous and in need of company, obsessed with spending his free time playing all kinds of games with anyone (un)fortunate enough to be around. His total focus while at the board, and his ‘vagueness’ away from it, are in contrast to the challenger’s constant chatter during play. This clash is to be his swansong, his final match at the top level, and the tense atmosphere in the resort where the two players find themselves sealed off from the outside world gradually becomes unbearable, both for the players and the observers. Mind you, if you were watching – or playing – a game for six months, your nerves would be slightly frayed too. It is the narrator, a thinly disguised Kawabata, who points us in this direction. In the vein of one of Kazuo Ishiguro’s less than trustworthy speakers, he muses, considers and suggests, all without committing himself, pointing out irregularities in proceedings, hinting at events happening beneath the surface, but always letting the reader decipher the meaning he is half concealing. Has the schedule been designed to grind down the old man’s health? Is the Master more concerned with the spirit of the game than the actual result? That’s up to you, dear reader, to decide. All in all, The Master of Go is another wonderful piece of J-Lit and a worthy addition to my quickly expanding Japanese mini-library (the Chinese have been expelled from the top shelf, and an invasion of the Russian-held middle shelves is only a matter of time). Despite the minor quibbles noted in the previous paragraph, this has probably been my favourite long Kawabata work so far (my favourite work would probably still be the long short story The Izu Dancer), and I’m keen to move on to the next one. So, when are the Book Depository and Abe Books having their next 10% off sale? You have definitely sold me; I will read this book for the JLC5. I've long heard about, and been interested in, the title. But, I also want to read more Kawabata's work. Like you, I have a large Japanese and Russian shelf (but not Chinese). Thanks so much for joining, Tony, it's great to have your thoughts. Enjoyed your review, and as you know from my own review of this I enjoyed the book, you're right to point out that an understanding of the game isn't necessary, (although it would another dimension) it could easily have been chess as it was about the protagonists, not sure about the bit about wearing the old man down, as if I recall correctly it was he who was the greater procrastinater & who constantly changed the schedule much to the annoyance of the younger. Thanks for this great post reminding me of a writer I enjoyed & I will seek out that short story. Hope to see more of you this half of the year! All the best. Sakura – I'm sure I've played this at some point, and it's not as easy as it looks! Stu – Definitely one for you – not much happens, especially as we already know the ending at the start! JoV – I've got down to my last Murakami fiction reread now ('Blind Willow…'), and I'll be reading Jay Rubin's biography/analysis after that. I would like to read 'Birthday Stories' at some point though as it looks interesting and would show what Murakami considers good writing. I think I preferred this to my previous two Kawabata reads because of the length – this is a novel while the other two were uncomfortably placed between a long short story and a novella (if that makes sense!). We're Melville House, a small independent publisher based in New York. We publish a wide range of books – fiction being the most prevalent. We're trying to ignite some conversation about one of our latest books, “The Lake,” by Banana Yoshimoto, and we think you'd enjoy it. It would make a great addition for the Japanese Lit challenge! Please let us know how we can contact you. You can reach us at melvilleintern(AT)mhpbooks(DOT)com. Thanks! Hi Tony, thanks for directing me to this post. You are so right to point out how this book isn't about the match, really, but the game in general as art, and the Master's life as art. As you already know I totally loved this. I'm thinking of getting Kawabata's Palm-of-the-Hand Stories, which is a collection of his shorter works. I wonder if The Izu Dancer is included in it.